Though I live about 2 miles away from a family-friendly lagoon, and four miles from the main beach, I’m not such a fan of the water. But this morning, after discovering that there’s a spot of sand for dogs to run at the beach, I took our little chihuahua mix there for the first time. She loved it and I’ll be taking her again tomorrow. This time I’ll pack water, too, and maybe a beach chair so I can sit and read a book like I saw other dog owners do today. 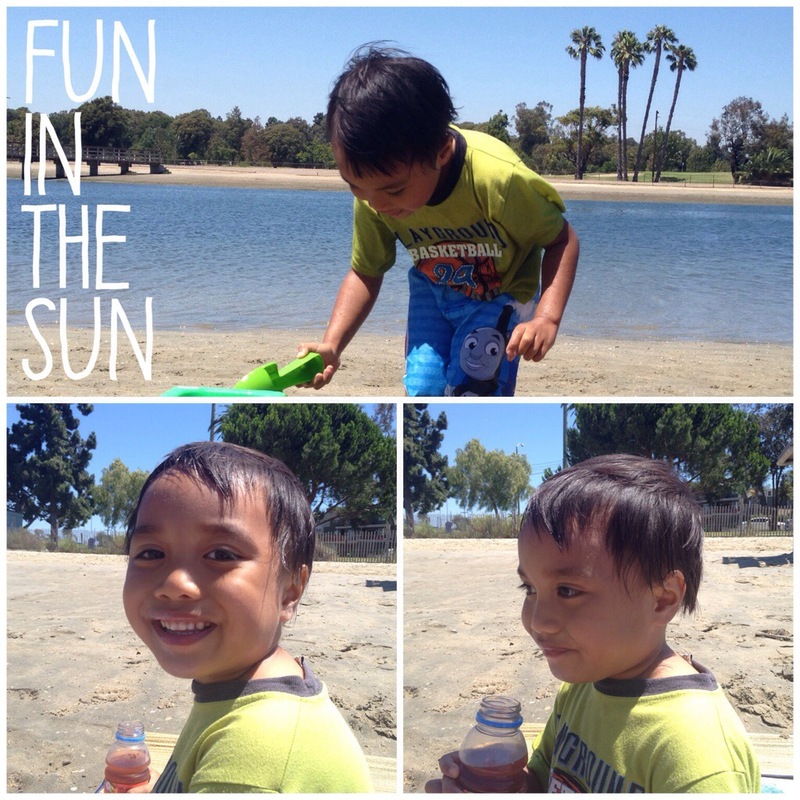 In the afternoon, after the little guy came home from summer school, we went to the lagoon. I brought along the sand castle paraphernalia and even wore a swim suit underneath my tank top and shorts. For someone who does not like being in the water (cue Jaws music here and the latest news that a local man got bitten by a shark close to the Manhattan Beach pier), being in a lagoon is still a big thing for me. I just don’t like the water. But the little guy does. And today, he was thrilled to bits that his mommy finally took him to the beach and actually stayed long enough to acquire some unwanted shorts tan lines. He actually smiled…and so did I. Tomorrow, I’ll be more well-prepared. Water (and water dish) for the dog when we go to dog beach, and in the afternoon, an umbrella to hide from the sun and any more unplanned tan lines. Oh, and knowing where the showers are to wash all that sand off instead of trekking it all in the car and then realize, too, that we were both still wet from being in the water. That’s okay though. One day, I’ll get it right. This made me smile. I grew up in the ocean and swam with all the things with teeth and spines thinking they would never bother me. Now, I’m not so sure. My grandmothers old car always smelled like hot sand and wet kids. Oh yes, and in the midst of swimming towards my father’s boat, someone shouting that there was a sea snake nearby – I think that about did it for me then. Don’t forget the sun screen.